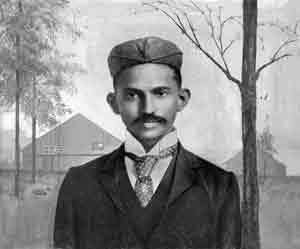 Gandhi was born on October 2, 1869 in Porbandar, Gujarat, India. Several members of his family worked for the government of the state. 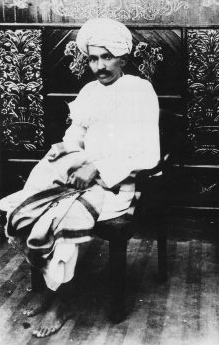 When Gandhi was 18 years old, he went to England to study law. After he became a lawyer, he went to the British colony of South Africa where he experienced laws that said people with dark skin had worse rights than people with light skin. He decided then to become a political activist, so he could help change these unfair laws. He created a powerful, non-violent movement. 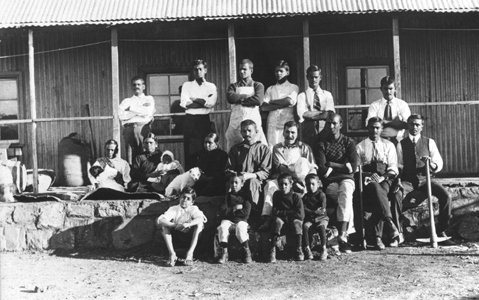 During Gandhi's life, India was a colony of the United Kingdom, but wanted independence. In 1947, British Indian Empire became independent, and broke into two different countries, India and Pakistan. 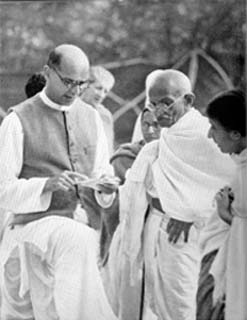 Gandhi wanted independence, but did not want to split into two different countries. Instead of celebrating on independence day, he was crying over the division of India. On January 30, 1948, Gandhi was assassinated by an extremist Hindu activist , Nathuram Godse. He shot him because he felt that Gandhi was too lenient towards Muslims. As a punishment for this he was hanged. Sabarmati Ashram, Gandhi's home in Gujarat as seen in 2006. 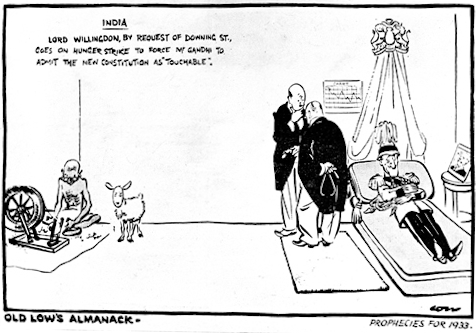 A 1932 cartoon; Lord Willingdon goes on hunger strike to force Gandhi to admit the new constitution as "touchable"
Memorial at the former Birla House, New Delhi, where Gandhi was assassinated at 5:17 pm on 30 January 1948 on his way to a prayer meeting. Stylised footsteps are shown leading to the memorial. Statue of Mahatma Gandhi at Parliament Square in London, 2015. Standing in front are British Prime Minister David Cameron, Indian P.M. Narendra Modi, and others. Monument to M. K. Gandhi in New Belgrade, Serbia. On the monument is written "Nonviolence is the essence of all religions". Monument to M. K. Gandhi in Madrid, Spain. The Gandhi Mandapam, a temple in Kanyakumari, Tamil Nadu in India. This temple was erected to honour M.K. Gandhi. Mahatma Gandhi Facts for Kids. Kiddle Encyclopedia.